PATA Travel Mart 2005 (PTM05), the most important travel contracting and networking event in Asia Pacific, held in Kuala Lumpur September 27-30 with over 1,200 delegates from 54 countries including Korea participating in. Held at the newly-opened, high-tech and strategically located Kuala Lumpur Convention Center in the heart of the Malaysian capital, it has attracted 704 seller organizations from 37 countries, 342 buyer organizations from 54 countries and 131 media delegates. Peter de Jong, president and CEO of the US-based Pacific Asia Travel Association (PATA), the organizer of PTM05, expressed his satisfaction with the turnout. "For the world's travel and tourism industry, the big expectation is the growing inbound, outbound and domestic power of Asia Pacific," he said. 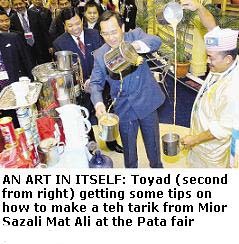 Datuk Dr. Leo Michael Toyad, the Malaysian Minister of Tourism, said in his welcome address, "I believe Malaysia's hosting of this event will allow the country to leverage on PATA's extensive contacts and strengths in the Pacific Basin markets. PATA has developed various expertise for the development and management of tourism resources and Malaysia, as an active member, has benefited from such experiences." During business appointments at the travel mart, buyers had a chance to check out the latest products available from sellers over three days. Besides country briefings by tourism authorities, the delegates had an opportunity to take part in interactive discussions and post-tours to various parts of Malaysia. He went on to say that successful repositioning of the event and strong strategic support from Tourism Malaysia and Malaysia Airlines contributed to its success. "This year we have seen continued growth in buyers who are the people who send business and tourists to Asia Pacific. The mart has also grown in stature with both buyers and sellers stressing the Mart as a first-rate networking environment," Peter de Jong told a press briefing. Malaysia has recorded a total of 9,485,074 tourist arrivals from January to July 2005 compared to 9,116,478 tourist arrivals for the same period in 2004, representing an increase of 4.0%. Tourist arrivals from Korea, Australia and India increased handsomely during the period while those from its neighbors Singapore, Thailand and Indonesia continued to grow steadily.